No matter where you live or what you do with your horse, he requires certain annual core vaccines to keep him protected from deadly diseases. Other inoculations depend on your region and your horse's risk of exposure to specific diseases. Your vet can tell you which vaccines your horse needs and their frequency. According to the American Association of Equine Practitioners, the core vaccines are tetanus, rabies, Eastern and Western equine encephalitis and West Nile virus. In mature horses, the tetanus vaccine is initially administered in two doses spaced three or four weeks apart, followed by an annual spring booster. The combination encephalitis vaccine is initially given in two doses, six to eight weeks apart, with an annual spring booster thereafter. If mosquitoes, which spread the diseases, are a year-round problem, your horse receives a second annual shot in the fall. West Nile virus is initially given in two doses three to six weeks apart, followed by an annual spring shot. This disease is also spread by mosquitoes, and your horse might need an additional shot in the fall, depending on your area. 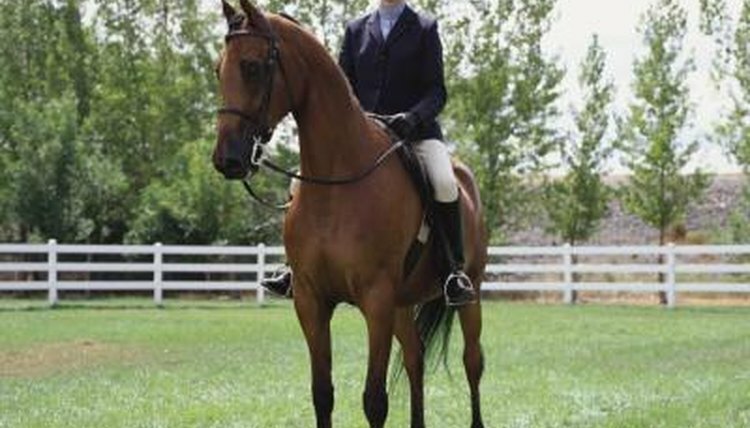 Your vet administers an annual rabies shot to your horse, in either spring or fall. Your vet might recommend other vaccinations based on your horse's risk level. If your horse lives in your backyard and rarely comes into contact with other equines, he's at low risk for most contagious diseases. If you show or otherwise travel regularly with your horse, he's much more likely to be exposed to disease. Even if your horse doesn't travel much, if you keep him at a boarding barn with horses constantly coming and going, he's at risk for disease exposure. Although they are considered risk-based vaccine, the twice-yearly equine influenza vaccine and the equine herpes virus shot are recommended by most vets. The latter disease is also known as rhinopneumonitis. If your horse lives near water on the East Coast, your vet might recommend vaccinating for Potomac horse fever, although this vaccine provides only partial protection. Horses who travel frequently or those at large boarding facilities might need a strangles vaccine, given initially in three intranasal doses two to three weeks apart, with spring and fall boosters thereafter. If botulism or anthrax is endemic in your region, your vet might recommend these vaccinations. Stallions and mares should be vaccinated annually for equine viral arteritis. While stallions should be inoculated several weeks before the breeding season, mares can be vaccinated whenever they are not in foal. (This disease can cause abortion in pregnant mares or kill their young foals.) Mares can contract equine viral arteritis from unvaccinated stallions. A foal's vaccination schedule depends on the vaccinations his mother had, as some disease antibodies pass through to the baby via the milk. The American Association of Equine Practitioners recommends that foals of vaccinated mares receive tetanus, encephalitis and West Nile virus shots in a three-dose series beginning between the ages of 4 to 6 months, with a four- to six-week interval between the first two doses and the final dose (given at approximately 1 year of age). Foals of unvaccinated mares should start receiving tetanus shots between the age of 1 and 4 months, with a month between doses. The three encephalitis and West Nile virus shots should start between the ages of 3 and 4 months, with a one-month interval between the first two doses and two months between the second and third. All foals receive rabies vaccinations at the age of 1 year.